Corey Locke has skated into territory previously tread by only two other players in team history. Hamilton center Corey Locke has skated into territory previously tread by only two other players in team history. Pretty soon it will be time to see which of those men he winds up following, Brian Swanson or Tomas Plekanec. The paths set by those players veer off in wildly different directions. Locke, with 176 career points (61-115), has moved into a tie with Plekanec (71-105) for second place on the Bulldogs’ all-time scoring list. He needs four points to overtake Swanson (71-108-179) and become Hamilton’s leading scorer. Plekanec is a budding star with the parent Montreal Canadiens. Swanson never was able to translate his success in Hamilton into steady NHL work and now plays in Europe. Locke sees the fork and is adamant about which way he wants to turn. It is, naturally, the harder course and, to this point, more elusive. For all his production with the Bulldogs, the 23-year-pld Locke has yet to play a single minute in the NHL. 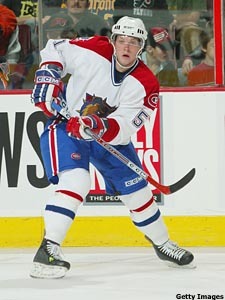 Locke, a fourth-round pick by Montreal in 2003, likely is hurt by his size – 5-foot-9, 168 pounds. And while his skating is good, it’s not mighty-mite blazing. The only numbers about him that are impressive are the ones he continues to put up, the stats that will make him Hamilton’s top dog by a wide margin. Keeping Penalties In The Family – There are some interesting family connections at both ends of the AHL’s penalty-minutes spectrum. On the heavy side, Syracuse forward Tom Sestito is second among rookies with 80 penalty minutes. Brother Tim, a defenseman with Springfield, paces league rookies with 23 minors. Conversely, Bridgeport blueliner Jamie Fraser barely remembers what the inside of the sin bin looks like. He had no penalty minutes through his first 25 games. Then again, he should know the rules – his cousin, Ryan, is an AHL referee, and his uncle, Kerry, has officiated more games than any other referee in NHL history. Ironically enough, Jamie claims he does have a penalty this season, and courtesy of Ryan, at that. He said Ryan whistled him for tripping in a contest earlier this year, and he went to the box. But when Jamie looked on the score sheet afterward, teammate Mark Wotton was credited with the two minutes. “I can’t take a penalty even if I get one,’’ Jamie said. Goalie Carousel Not Slowing Bruins – Providence’s team defense has been so good this season, it’s threatening to turn the normally vital position of goalie into an interchangeable part. Bruins coach Scott Gordon admitted that he never could have foreseen his team thriving to the extent it has with the losses of netminders Tuukka Rask (NHL call-up) and Jordan Sigalet (illness). But the numbers say it’s true – Providence is 12-2-1 without Rask and Sigalet, and 11-2-1 with them. Part of that success should be stuffed into the duffel bags of standout ECHL call-ups Mike Brown and Andy Franck. But their modest save percentages (.885 for Franck, .891 for Brown) suggest that they aren’t put in a position to have to make every save, just the crucial ones. The keys are simple. The team plays keep-away with the puck, leading the AHL in shots taken per game (34.8) and fewest allowed (23.6). Providence’s 154 minors is the fifth-lowest total in the league, so there’s rarely any power-play pressure on its goalie. Notes – Hamilton claimed center Daniel Corso off AHL waivers from the Houston Aeros. Corso, 29, posted 11 points in 20 games this season with Torpedo Nizhny Novgorod of the Russian Super League before signing a contract with the Houston Aeros and being placed on AHL entry waivers. … Former University of Maine Black Bear Teddy Purcell, who was the Rookie of the Year with that team in 2006-07, felt right at home on Dec. 18 as he collected three points in Manchester’s 6-2 toppling of Portland at the Alfond Arena on the campus of the University of Maine. ... Prior to a Dec. 15 contest against Iowa, Chicago center Kevin Doell had scored two goals in 26 games this season. Then he burned the Stars for three tallies in a 77-second span. That was 20 seconds shy of the all-time league record, set by Billy Jennings of the Indianapolis Capitals, who netted three in 57 seconds on Feb. 16, 1941. ... In that game against Iowa, the Wolves scored 10 goals on just 17 shots, a shooting percentage of 58.8 percent. … Syracuse goalie Tomas Popperle has been lost for the season with torn ligaments in his knee. To help replace him, the Crunch brought back Karl Goehring, who played with the team from 2001-05 and is the franchise’s all-time leader in wins (64). … Denis Hamel of host city Binghamton and Keith Aucoin of Albany will serve as playing captains for the 2008 AHL All-Star Classic next month. Detroit GM Ken Holland and St. Louis GM Larry Pleau will be the honorary captains. … After attempting to play with anterior cruciate ligament damage in his right knee, Manitoba Moose wing Jozef Balej has decided to have season-ending surgery. … Toronto left wing Simon Gamache has been selected to represent Canada at the upcoming Spengler Cup in Davos, Switzerland. … Albany suffered a horrendous bout of the flu last weekend. The Rats dressed only 14 skaters against Wilkes-Barre/Scranton on Dec. 15. The next day, against Bridgeport, Albany had 13 players out with either injury or illness. Albany was forced to call up seven players from the Elmira Jackals of the ECHL for that game, an AHL/ECHL record for most players called up in one day to the AHL from one ECHL team. ... Hartford’s Civic Center has been renamed the XL Center.